The NFL Championship game on December 30, 1962 featured the same two teams who had faced off for the title in ’61 – the Green Bay Packers and New York Giants. In that instance, the Packers had blown the Giants out by a 37-0 score at Green Bay. Now they were meeting on New York’s home turf in the rematch. The Packers, under Head Coach Vince Lombardi, had gone 13-1 in placing at the top of the Western Conference for the third straight year. Hard-hitting FB Jim Taylor had a MVP season as he led the NFL in rushing with 1474 yards (the first NFL runner not named Jim Brown to do so since 1956) and scored a record 19 touchdowns. QB Bart Starr was the league’s top-rated passer and the offensive line was outstanding. Even the off-year for HB Paul Hornung, who had won three straight scoring titles from 1959 to ’61 but was hampered by a bad knee, could not derail the offense, and All-Pro G Jerry Kramer (pictured above) had taken over Hornung’s placekicking responsibilities. The defense was just as strong and yielded the fewest points in the NFL. Head Coach Allie Sherman’s Giants came in first in the Eastern Conference at 12-2, winning their last nine games in doing so. The brilliant passing of QB Y.A. Tittle was the key to the offense – he had set a new NFL record with 33 TD passes and had excellent targets in split end Del Shofner, flanker Frank Gifford, and TE Joe Walton. FB Alex Webster was effective both running the ball and as a receiver out of the backfield. The veteran defense was solid. There were 64,892 in attendance at frigid Yankee Stadium. Temperatures were in the teens and with winds gusting as high as 45 mph, the wind chill was below zero. Traction was difficult on the frozen turf and whirlwinds of dust occasionally blew about. The Giants had first possession and reached their own 46 before having to punt. Jerry Kramer put the Packers on the board with a 26-yard field goal midway through the first quarter after Green Bay drove 61 yards to the 19 yard line and Jim Taylor was stopped for no gain on third down and short. The Giants threatened, driving to the Green Bay 15. However, MLB Ray Nitschke deflected a Tittle pass that was intercepted by LB Dan Currie to end the threat and returned it 30 yards before falling. Following the interception, the Packers advanced to the New York 30 but Kramer missed a field goal try from 37 yards. A punt by Max McGee was nearly blocked by CB Erich Barnes but the rushed kick went only 23 yards. 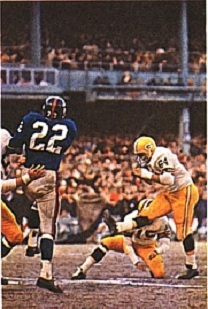 Two plays later, HB Phil King fumbled when hit by Currie and Nitschke recovered at the New York 28. 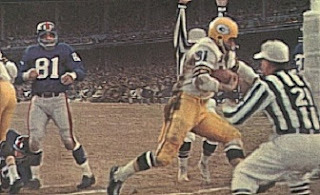 The Packers capitalized as Paul Hornung tossed an option pass to flanker Boyd Dowler for 21 yards and Taylor followed up with a seven-yard touchdown run up the middle (pictured below). Now late in the second quarter, the Giants responded by moving into Green Bay territory. However, Don Chandler attempted a 47-yard field goal for the Giants that went wide of the mark. The Packers took a 10-0 lead into halftime. Early in the third quarter, Green Bay’s offense couldn’t advance the ball while backed up deep in its own territory. 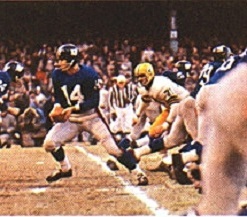 With the Packers punting from their own 15 yard line, Barnes broke through this time to block McGee’s kick and end Jim Collier fell on the loose ball in the end zone for a New York touchdown after LB Bill Forester was unable to scoop it up at the five (picture below shows Barnes at right just before blocking the punt). With the successful extra point, it was a three-point game. Once again the Packers couldn’t move on offense, but McGee’s line-drive punt was muffed by DB Sam Horner and Nitschke recovered at the New York 42. The five-play series culminated in a 29-yard field goal by Kramer. The Giants, now down by six, drove into Green Bay territory with the help of penalties. 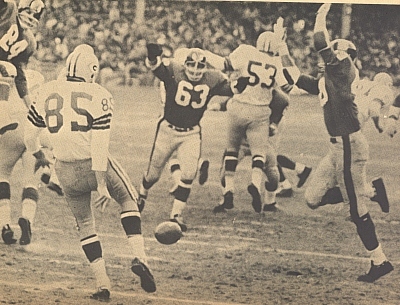 From the Green Bay 47, Tittle threw a pass intended for Del Shofner that fell incomplete. However, FS Willlie Wood was charged with pass interference and when he leaped up to protest he inadvertently knocked the official, back judge Thomas Kelleher, to the ground. It resulted in Wood’s ejection and another 15 yard penalty on the Packers that advanced the ball to the 18. Tittle overthrew Shofner and the Giants followed up with a double reverse in which King lateraled back to Tittle who was under pressure from DE Willie Davis and threw a bad pass that was almost picked off by Currie. Two holding calls on the Giants moved the ball all the way back to the 40. On third-and-52, Tittle threw short for flanker Frank Gifford, who dropped it. The Giants came up empty. Early in the fourth quarter, HB Elijah Pitts returned a punt 36 yards and nearly broke it all the way. Bart Starr passed the Packers down to the New York 27 but they lost ground from there and Kramer was unsuccessful on a 40-yard field goal try. The Giants were unable to move on offense and punted. Taking over at their 28, the Packers kept the ball on the ground and reached the New York 24. With 1:50 remaining in the game, Kramer kicked his third field goal to effectively seal the win for the Packers. The Giants drove to the Green Bay seven on their last possession before time ran out. Green Bay was the champion once again by a score of 16-7. The Giants outgained Green Bay (291 yards to 244) and the clubs were even in first downs with 18 apiece. The Packers were more successful at running the ball (148 yards to 94) and New York turned the ball over three times while Green Bay’s offense suffered none. Jim Taylor had a hard-earned 85 yards on 31 carries that included a touchdown and gained 20 more yards on three pass receptions. Moreover, he engaged in a personal battle in the trenches with New York’s defense (most notably star MLB Sam Huff), often exchanging words and exemplifying the game’s intensity. Bart Starr completed just 9 of 21 passes for 85 yards while Paul Hornung, who contributed 35 yards on 8 rushing attempts, also tossed a key halfback option pass for a 21-yard gain. Boyd Dowler led the Green Bay receivers with 4 catches for 48 yards. Ray Nitschke recovered two fumbles and had the pass deflection that was intercepted and was named MVP of the game by Sport Magazine. As if the wind was not enough, Y.A. Tittle (pictured below) was under constant pressure throughout the game. He was successful on 18 of 41 throws for 197 yards with no TDs and one interception. Joe Walton and Del Shofner had 5 catches apiece, for 75 and 69 yards, respectively. Alex Webster ran for 56 yards on 15 carries and Phil King added 38 yards on 11 attempts. “Green Bay is obviously a worthy champion, because they have things they had to overcome and they went out there and overcame them and got the points,” said Allie Sherman from the losing side. The Packers barely missed out on winning the Western Conference again in 1963, finishing a close second to the Chicago Bears. They would win their next league title in 1965. New York topped the Eastern Conference yet again in ’63, but once more fell short in the Championship game. In two title games, the Giants failed to score a single offensive touchdown against Green Bay.